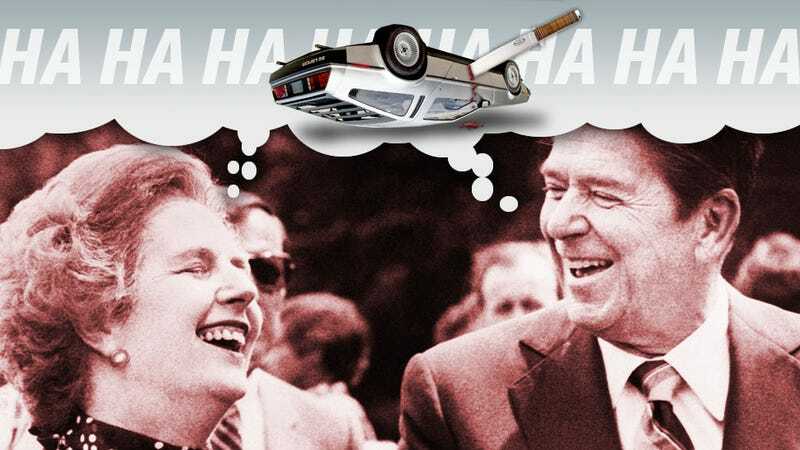 Did Ronald Reagan And Margaret Thatcher Conspire To Kill The DeLorean? The DeLorean DMC-12, despite its "Back To The Future" buzz and scintillating stainless steel skin, never became the success some thought it destined for and the last to save it was mysteriously interrupted. Did the Reagan White House guide the British government to let the company die so it could entrap its creator in an FBI-run drug smuggling bust? Nick Sutton was a senior Manager of DeLorean Motor Cars, a junior member of the UK Consortium and later became a Director of Lotus Cars two years after Colin Chapman’s death. This is a chapter from his book: The DeLorean Story, the Car, the People the Scandal, published by Haynes, about the company's rise and fall. — Ed. Margaret Thatcher vetoed a plan by a UK Consortium to save the DeLorean car company in Northern Ireland, then in receivership, which would have saved 1500 jobs and secured at least part of the UK government’s $160 million investment in the project. Weeks earlier she had been told that $17.65 million had been taken from the company’s coffers and that the likely culprit was John DeLorean and associates. “I can build you a factory, design and produce a car, employ two thousand people all in eighteen months” DeLorean declared to the British government in June 1978. The catch was that he needed $100 million. His offer was accepted, but in return he was told that the car had to be built in West Belfast, Northern Ireland. Despite setbacks caused by styling changes to the car’s original design and sectarian conflict, that brought Northern Ireland close to civil war, the project took twenty six months to the first car and $160 million of tax payer’s money. The company was continuously dogged by cash shortages and poor quality. It went bust in February 1982 due to over production. Just three months after signing the master agreement with the British government, in July 1978, well before the foundations of the factory were laid, DeLorean decided that he should benefit personally from the cash windfall, courtesy of the investors. A contract with Colin Chapman chairman of Lotus through an intermediary GPD, a Panamanian company with offices in Geneva, would be the conduit to move the cash out of the company. In all $17.65 million of payments went walkabouts to GPD and onwards. The money was split between Colin Chapman chairman of Lotus and John DeLorean with the loose change going to Fred Bushell the finance director of Group Lotus. The fraud would have gone unnoticed if not were not for receivership. It wasn’t too long before the receiver’s staff noticed a hole in DeLorean Motor Cars Ltd’s accounts and reported this to the government. So what made The Iron Lady reject the sound business proposal made by a UK Consortium, a plan approved by the Receiver, Sir Kenneth Cork and the Secretary of State for Northern Ireland, James Prior? The UK Consortium’s proposal also limited DeLorean’s involvement in the project and added a second vehicle to the line-up at the plant in Belfast; it was a perfect plan, except the initial £80,000 to allow due diligence was to be funded by the Northern Ireland Office, which they had already agreed, but final approval from the Prime minister was necessary. Much to everyone’s consternation she rejected the plan outright. It was now DeLorean’s turn to make proposals to fund the revival of his fledgling car company. In desperation he took the bait from the FBI posing as cocaine drug dealers during a phone call they made to DeLorean on 30th June 1982 (Three weeks earlier Margaret Thatcher met Ronald Reagan in London). Time after time the British government gave DeLorean more breathing space, a commodity they didn’t offer the UK Consortium, deadlines came and went; each week brought a fresh announcement of a new backer by John DeLorean non believed by the receiver to be real. During this period the home and business ‘phones of key employees were wired by authorities on both sides of the Atlantic. Finally the last deadline was given as 19th October, if by then John DeLorean had come up with the money the company in Belfast would definitely close. DeLorean chose the easy route for funding and met the FBI that day posing as drug dealers. They met in a Los Angeles airport hotel room. During DeLorean’s later drugs trial Gerald Scotti a former DEA agent involved in the entrapment of DeLorean said, ‘I knew from a long way back the (US) government would go to any lengths to prosecute Mr. DeLorean ’. Scotti also gave evidence that he overheard a heated argument the night before DeLorean’s arrest between the two law-enforcement agents, he said the name of ''Mr Meese'' was mentioned. Edwin Meese was then counselor to the President. Was Margaret Thatcher aware of the impending drugs bust drama being played out in the US when she rejected the UK Consortium’s plan so DeLorean could be lured into the FBI trap? Catching DeLorean dealing with drugs would be a huge bonus for Ronald Reagan as he was about to launch an issue close to his heart: The War On Drugs. His announcement of the programme was made during his weekly radio broadcast on 2 October 1982. DeLorean’s arrest and associated scalp would hit the headlines a few weeks later providing a kick start Ronald Reagan’s initiative. The rest is history except for a little known fact that occurred during the Receiver’s discussions with Colin Chapman; Chairman of Group Lotus. The receiver asked Chapman about the GPD contract to which the Lotus chairman initially denied any knowledge. Before a second interview could take place Chapman flew to Paris to meet Jerry Juhan who together with his wife Marie Denise Juhan- Perrin had brokered the GPD deal. Colin Chapman left Paris that evening and landed at the Lotus factory airstrip in the late evening of 15 December. Hours later he was dead. DeLorean’s share of the GPD deal was found and returned to the Receiver, Colin Chapman’s cut was never located but his estate agreed to a settlement with the UK government of £4.67 million. Fred Bushell Group Lotus finance director pleaded guilty to all charges and was sentenced to three years in jail and fined £4.5 million. This story originally appeared in The DeLorean Story: The Car, The People, The Scandal by author Nick Sutton and published by Haynes. It was republished with the permission of the author.